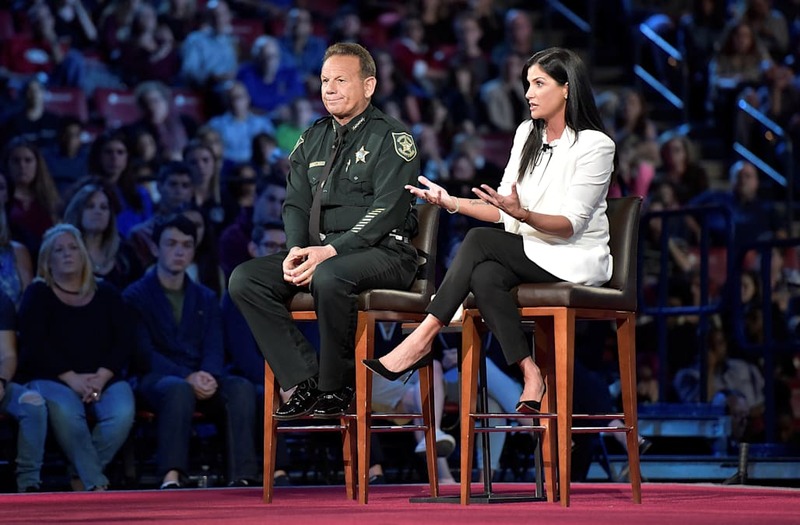 During a heated CNN-hosted town hall event on Wednesday night, National Rifle Association spokeswoman Dana Loesch told survivors of the Parkland, Florida school shooting that she was “fighting” for them. But Broward County Sheriff Scott Israel was quick to shut her down. Interrupting Loesch’s response to a question about assault weapons, Israel stressed that she was “not standing up” for survivors of gun violence. The sheriff’s words were met with cheers and a standing ovation. Loesch was roundly lambasted at the town hall and on social media for various comments she made about gun control, many of which were misleading. Parent Fred Guttenberg watches a monitor honoring the 17 students and teachers who were killed at Douglas High School, during a CNN town hall meeting, at the BB&T Center, in Sunrise, Florida, U.S. February 21, 2018. REUTERS/Michael Laughlin/Pool Guttenberg lost his daughter Jamie in the attack on Valentines day. “People who are crazy should not be able to get firearms,” Loesch said, echoing a common misconception that mental health issues are a primary cause of gun violence. Her remark also ignores the fact that the NRA has also vocally advocated against gun bans on people with mental illness. Netizens took to Twitter to challenge her remarks. Loesch’s answer ignores the fact that Cruz was not adjudicated mentally unfit. He was not a prohibited purchaser. Loesch was also roundly criticized on social media for suggesting that “fully-automatic firearms” existed during the time of the founding fathers. Twitter did not hold back their ridicule. The Puckle Gun (the “machine gun” from 1718) had a 3 foot long barrel, had to be set up on a stand, required a crew of two or three men to reload, and shot 9 rounds a minute.